The Hour of Code is a global movement reaching tens of millions of students in 180+ countries. The Hour of Code is a one-hour introduction to computer science, designed to demystify code and show that anybody can learn the basics. Anyone, anywhere can organize an Hour of Code event. One-hour tutorials are available in over 40 languages and no experience needed. This year, Hour of Code events are taking place around the world December 7-13, 2015. In fact, there are over 170,000 Hour of Code events happening all around the globe this year! 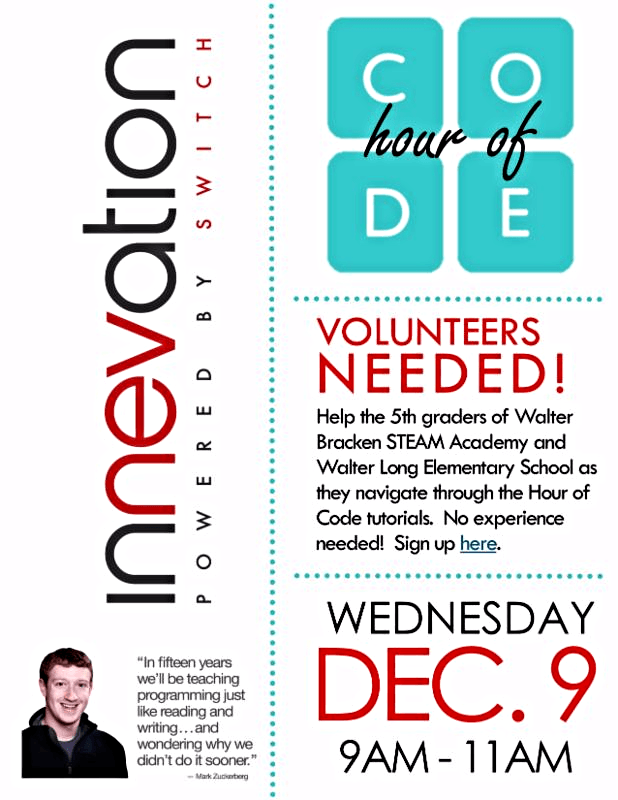 In Las Vegas, Hour of Code will be taking place at The Innevation Center on Wednesday, December 9, 2015. This year, The Innevation Center decided to partner with Katie Decker, Principal of Walter Bracken STEAM Academy and Walter Long Elementary School for the Hour of Code event. A friend of mine sent me an email about this last volunteer program. I am 29 yrs -old & took my first programming class this past summer at CSN – Intro to Programming with the last weeks dedicated to Python. I am available to help out in any means possible; I’m a team player. I’m interested to see how to implement coding to the younger generation in a fun & engaging experience. I have a niece & nephew out of state age 10 & 9. I recently bought them an used Samsung 17″ Laptop i7 quad core 2nd gen & replaced the HDD with a SSD & I also spent $200 on a programming software for them called “Modding for Minecraft” (something like that) – Youth Digital was the company. In conclusion, I’d like to learn and help others in any meaningful way. As a side note my cell phone reception is in the best so if I do not answer because of bad reception please leave a detailed voicemail and or an email confirmation, if you desire my participation.